Call for a morning lineup in the Young Pioneers' camp "Yuny Kosmonavt". Do you know what pioneers did on “royal night” before home time? Most adults of a certain age in today's Russia get twangs of nostalgia when thinking about the pioneer camps of their Soviet youth. In the 1980s such camps numbered about 40,000, and more than 10 million children spent their summer vacation there. The actual idea of ​​the camps was conceived in the 1920s, but back then they were more like Scout-style tent cities. The process of setting up real camps with the involvement of Young Pioneer leaders and educators got underway in 1925. The primary purpose of the camps was to produce ideologically grounded members of socialist society and builders of communism. To that end, much time was devoted to ideological activities and “political information.” However, that's hardly the main reason why former pioneers remember the camps so fondly. 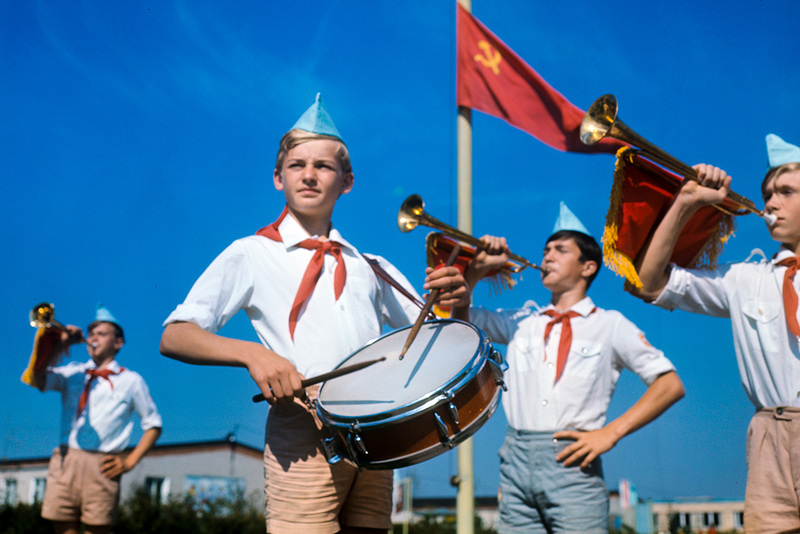 Planning children’s summer vacation was a big deal in the Soviet Union. The country’s finest recreational spots were given over to the pioneer camps, where sport and health were top of the agenda. Every morning began with mandatory exercises out in the fresh air. After showering and before breakfast, pioneers took part in the mandatory line-up and hoisting of the flag. In late Soviet times, the whole process was considered a tedious chore. Pioneers were often sent to help out at local collective farms. If the task was to pick apples, apricots or other mouth-watering delights, it wasn’t work but pleasure. The lucky pickers could eat to their heart’s content. After breakfast, the fun really began. There were trips to the river or the sea, plus lots of games and chit-chat with comrades — all inevitably accompanied by the usual childish mischief. Sometimes camp teams were rewarded for exceeding a fruit-picking quota or some other achievement with the chance to go on a proper hike. It might be some nearby mountains or another scenic corner of the wild. Usually such outings also meant unshackling the iron chains of camp discipline, if only for a while. Bathing at the pioneer camp—whether it was in a river, lake or sea—always followed the same script. At a certain depth a net was put in place and one of the leaders stood there in the water. Another adult on the shore blew a whistle to let the children enter the water. The bathing period lasted a set number of minutes depending on the air and water temperature. Another whistle signalled it was time to come ashore, whereupon a headcount was taken. For the leaders, especially those who had to stand for long periods in the water, bathing was not the most enjoyable time, since there was extra responsibility on their shoulders to keep the children out of harm’s way. The whole time their gaze was focused on the children, who were all diving, splashing and screaming with delight. Repeated headcounts were made to ensure that no one had drowned. After bathing came the most eagerly awaited moment of camp life: lunch. Although pioneers often complained about the monotony and asceticism of the food, the camps generally provided decent nutrition for growing bodies. The most popular items on the menu were always buns and simple bread, which were snuck out of the canteen in case of a sudden bout of hunger. After lunch there was “quiet hour,” when every pioneer, regardless of age, had to go to bed and fall asleep. Having woken up and snacked on kissel (a jelly-like drink) or kefir with cookies, the recharged pioneers were given another dose of sport and leisure activities. However, the best was saved till last. At the end of the day, after dinner, there was a campfire with guitar-strumming songs, and sometimes a disco. The camp culminated with “royal night,” when pioneers would take toothpaste and try to paint the faces of their sleeping comrades. Come morning, no one ever wanted to go home and leave their new friends who were now family members. The farewell tears were coupled with the exchange of addresses and phone numbers with promises to write and never forget. Keeping in touch was hard in the pre-Internet days, though, especially after returning home to old school friends. Nevertheless, some managed to turn their pioneer pals into lifetime buddies.